Update patch Pro Evolution Soccer 6 latest season 2017/2018 created by Micano4u. This time it was named PES 6 Next Season Patch 2017/2018. PES 6 Next Season Patch 2017/2018 is based on PES 6 PECH Ultimate Patch by PES Chile, but has changed its appearance and added an update in the Egyptian league. 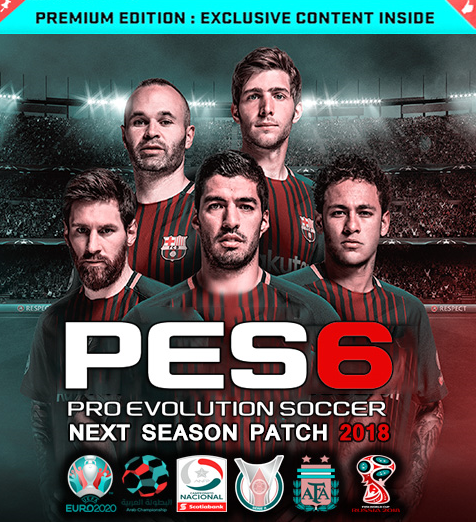 PES 6 Next Season Patch 2017/2018 also includes PES 6 games, so you no longer need to re-download PES 6 it. - Fix club names for all teams and competitions. - Update promotion team 2017/2018. - Update hair and face the latest players 2017/2018. - Latest boots & ballpack update 2017/2018. - HD Turf for multiple stages.